1,250 km of coastline, with a whole host of islands to choose from. In the north, 36 miles from Tabarka, the archipelago of Galite has six islands and is a popular, unique area for boat trips. These uninhabited granite islands are a little paradise of well-preserved nature. On either side of Bizerte, the coat is studded with charmingly enchanting capes and bays; a string of islands encircles the shore coastline – the Cani islands, the Fratelli islands, Pilau Island and Plane Island. From Gammarth, next to Carthage, you can travel by sea to the wild little coves of Cap Bon and Zembra island, a nature reserve and national park. 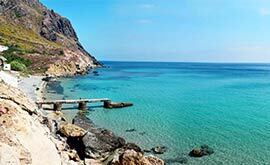 And if you are travelling along the Sahel coast near Sousse, you’ll find the small island of Kuriat. But to get back in touch with nature, what could be better than a break on one of Tunisia’s sunny southern islands, far removed from the hustle and bustle? Djerba and the Kerkennah Islands, on the edge of the country’s deep south, boast shimmering blue water, palm trees that sway gently in the wind and the peace and quiet of a landscape shrouded in a blanket of sand. The Kerkennah Islands (14 islands) are a well-kept paradise. The most famous of Tunisia’s islands, Djerba, is flanked by two smaller islands (El Guettaya Gablia and El Guettaya Bahria). And while the northern coast of Djerba has become a major tourist resort, the inland region and stunning white sandy beaches have managed to hold on to their peace and quiet. You can stay in an old country manor house – known here as a menzel –, in a little village house or in one of the many fondouks where travelling salesmen used to break their journeys. Under a whitewashed arch or in a mezzanine cooled by a fresh breeze, you can enjoy all the simplicity that traditional island life has to offer.